AS: Remarkable serendipity. I was doing a pure maths PHD when Triple J ran their first ever raw comedy search. The standard was terrible. So I won! Met them and left academia for a career in whatever it is that I do. AS: Rugby Union star David Pocock’s ability to stay on his feet at the breakdown and win that crucial ball, whilst signing a letter demanding a moratorium on new coal mines in Australia is pretty hard to top. AS: By saying demeaning things about prime numbers, chess or the Sydney Swans! AS: For a start, I’d be very uncomfortable with the quantum implications of my being able to determine the exact influence I have on anyone. Heisenberg’s uncertainty principle alone would suggest I could only be confident of my influence within a range. But that aside, if a few years from now I meet some young professional biostatisticians or computer coders who say they really got excited by my World of Numbers and sought out a science career, I’ll consider my job done. 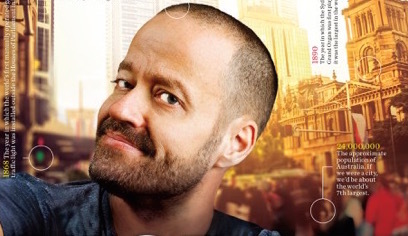 TBS: What advice would you give a 15-year-old Adam Spencer? AS: Strap yourself in nerd boy, it’s going to get pretty exciting in a couple of years. TBS: What is your most annoying trait? AS: I last relaxed in 2007 – for about 15 minutes – got stressed out that I hadn’t done anything for a quarter of an hour. TBS: What is the one gift you will pretty much always re-gift? AS: Sarcasm – I return it with interest. AS: “E = mc squared.” That one simple sentence can say so much about the universe in which we live still staggers me. TBS: What do you want people to get out of reading your new book, World of Numbers? AS: For trivia lovers, it’s just a tsunami of bizarre hilarious information – a box jellyfish has 24 eyes on the inside of its head so it has 360 degree vision from looking back through it’s hollow skull! – and for the mathematically minded, it’s a really fun workout for your grey matter. Something for every(nerd). 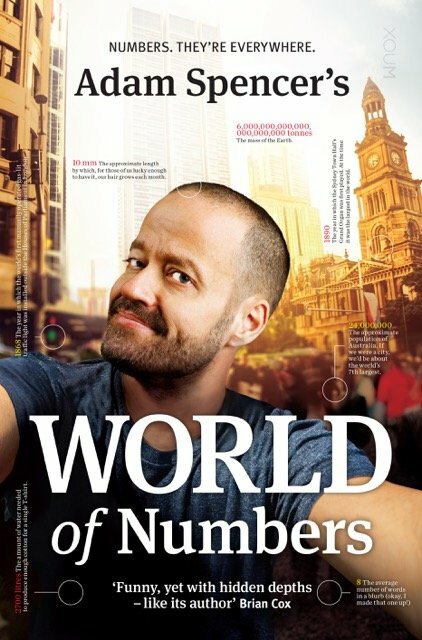 You can buy Adam Spencer’s book, World of Numbers, and get a signed copy here. I know what I am asking for Christmas for now!